commented on "The start of the centennial of World War I begins on 5 August (Britain declared war on Germany on 4 August 1914 but the time ..."
WWI - Your Country Needs You! The start of the centennial of World War I begins on 5 August (Britain declared war on Germany on 4 August 1914 but the time difference meant it was received in New Zealand on the afternoon of 5 August) and I've been working on a fantastic local commemoration project. I've been contracted by the Nelson Provincial Museum to work on a large scale, long term exhibition which will mark the province's experience of the war over the five year period of the centennial - 2014-2019. My role is to prepare the At Home aspects of the exhibition, while Anna Wilkinson is working on the At War material. We've come up with some great stories about Nelson people from across the province that will illustrate how the region reacted to the news the country was at war, how they quickly banded together to equip the men who enlisted, organised patriotic fundraisers, farewelled their boys, and got on with life. It will also explore the experiences of Nelson's German community, which suddenly found itself on the receiving end of anti-German sentiment. As an aside, the exhibition launch during the week of the centennial's start will be preceded by a Nelson Historical Society lecture I'm organising as president. Professor Jim McAloon, who wrote the province's official history, Nelson - A Regional History, will be giving the James Jenkins Memorial Lecture on Monday 4 August at 7.30pm in the Nelson College for Girls Hall, $5 entry. He will be giving an illustrated lecture discussing Nelson's World War I experience. Make sure you put it in your diary. The lead up to the World War I centennial was marked in March with the dedication of the 12th (Nelson) Regiment emblem on the hillside above the former Tapawera Military Camp. 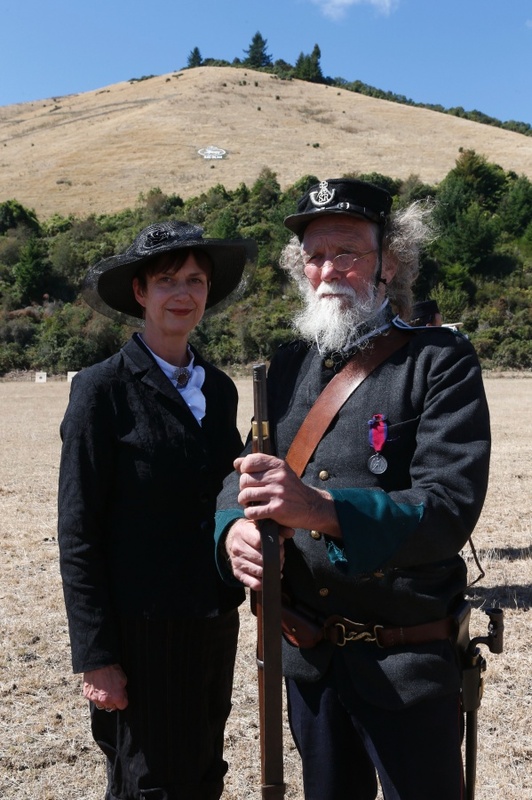 The photo shows me at Tapawera in my WWI costume with Maurice Taylor of the Tapawera and Valleys Historical Society, which spearheaded the reinstatement of the emblem, on the hill behind us.